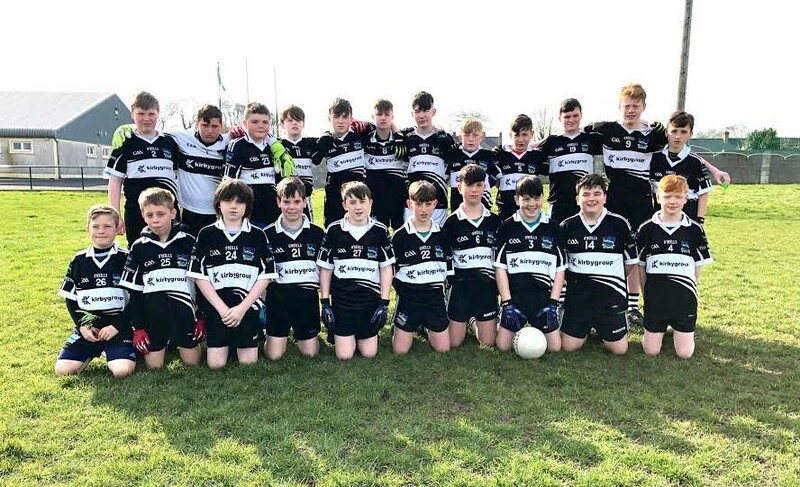 Well done to our U14 Football team (main photo) who played in the Féile Peil na nÓg qualifying competition at Mick Neville Park last week. The boys performed very well winning their first match against St. Senan’s, drawing with Askeaton Ballysteen Kilcornan, but unfortunately losing two matches to St. Kieran’s and Adare. The club would like to thanks everyone involved with the U14 team as they have put in a huge effort over the last few weeks preparing for Felie. Their attention now turns to Féile na nGael qualifying matches on Saturday April 13th taking place in Raheenagh. where they are drawn against Killeedy Tournafulla (10:00, Monagea Knockaderry (11:15), and Belville Gaels (12:30). We traveled to Mungret on Friday evening for the first round of the Premier Minor football championship. Being the first day out we were not quite sure what to expect from our lads but having lost to Mungret at U16 level knew we were in for a tough task. We started the game on the front foot and opened the scoring with a well taken goal and never let our opponents get ahead. After a dominant first half in which we scored 1-3 without reply between the 20 th and 30 th minute we led by 2-8 to 0-5 at half-time a lead which could have been greater but for some wayward finishing. Mungret came more into the game early in the second half and with 15 minutes to go the lead was down to 5 points. Our lads didn’t panic and showed their class and determination from then on to pull away and win comfortably. This was a very good team performance based on solid and disciplined defending, strong running and link play from midfield, and great interplay from the forwards. There remains plenty to work and improve on prior to the next round which will be after the exam break but overall a very positive start to the championship. Team & Scorers: Oisin O Sullivan, Andrew Mortell, Jody Woulfe, Michael Blashkiv, Evan Sheehan (0-1), Michael Cremin, Todd Donovan, Ruadhan O Connor (0-1), Killian Collins (1-0), Jack Duggan (0-1), Luke Gleeson (0-1), Bryan Nix (1-3), Brian Foley(2-1), Ethan Hurley(1-2), Jack O Connor (0-1). Substitutes: Morgan Sheehan (0-1) for Jack Duggan, Ciaran Al Quadi for Jack O Connor, Oisin Enright for Ethan Hurley, Leon Barry for Luke Gleeson, Keith Begley for Bryan Nix, Brian Coughlan. Unavailable through injury were Conor Walker and Evan McMahon. The focus now switches to the West Minor hurling championship with three games to be played before the exam break beginning on Thursday 18 th April with a home fixture against Croagh/Rathkeale. One positive is that the team management and the full panel are the same for both codes which assists in team preparation and managing player welfare. Best of luck to Ruadhan O Connor and the Limerick Minor Football team and management in the upcoming championship commencing with 1st round against Clare in Newcastle West on Wednesday 10th April. A tough fixture to start the u16 footballers championship campaign. An away game against one of the kingpins of underage football in Limerick. There have always been tough battles between these two sides and it’s fair to say this is an exceptional Mungret side. The Newcastle West boys never got going in the game on Monday where as Mungret were quicker off the mark and faster to the ball. Despite goals from Eddie Ward and Michael Blaskiv Mungret proved too strong for the magpie lads and ran out easy winners in a somewhat one sided affair. Next up for these lads County hurling Championship v Monaleen(away) next Tuesday (16th). Team and Panel : Paudie Kelly, Sean Thorley, John Whelan, James Lyons, Ethan Kirwan, Jack O’Connor, Michael Blashiv, Donal Burke, Leon Barry, Sean Geraghty, Ethan Hurley, Oisin Enright, John O’Grady, Eddie Ward, Tyler Clancy, Con Hayes, Harry Edwards , Patrick Noonan Sweeney, Paul Begley, Bryan Coughlan. Aaron Neville and Oisin Collins both injured. Mentors: Austin Geraghty, Mike O’Leary, Mike McMahon, Roger Hayes. Best of luck to our U14 players and mentors who take part in Féile na nGael qualifying matches on Saturday April 13th. 10:00 v Killeedy Tournafulla; 11:15 v Monagea Knockaderry; 12:30 v Belville Gaels. Good luck to all involved your support is much appreciated as always. Final preparations for Feile sees the U14s take on Granagh/Ballingarry in a Challenge match in Ballingarry on Wed April 14th @ 6:45pm. The first U10 Football Blitz for 2019 takes place Fri April 12th. The venue will be confirmed later in the week. The U10 hurlers will also be in action during halftime of our County Intermediate Hurling Championship match next Monday 15th in Croagh. Our U9 Hurlers take on Tournafulla in a Challenge match in Raheenagh @ 6:30pm. Training continues every Friday @ 6pm at the Ball Wall/All Weather Pitch. Training will commence Friday April 19th @ 6pm at the Ball Wall/All Weather Pitch. Newcastle West GAA Summer Camp will take place between 1st - 5th July this year. We will be holding a registration night very soon for the kids to try on sample gear for sizing. There will be no obligation to pay at this stage. This is just to get an idea of numbers and also to ensure your child orders the correct size when choosing their gear. The camp is available to all children born between 2005 and 2013. More information with dates/times/prices will follow later this week. Newcastle West 2-15 St Kieran’s 1-06. 10TH April Limerick V Clare Newcastle West 6.45pm. 14th April NCW v Kileedy home in NCW 6pm. There are 5 lucky dip winners of €40 each. The Next draw will take place on Monday April 15th in The Ballintemple Inn. Keep up to date with events on the field through our twitter and facebook profiles, by visiting our website www.ncwgaa.com, and downloading our new Mobile App.